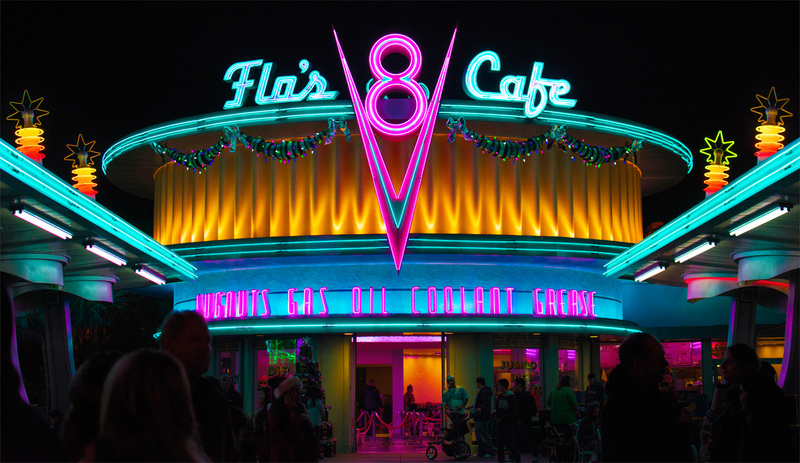 The phenomenal neon entrance to Flo's V8 Cafe in Disneyland. 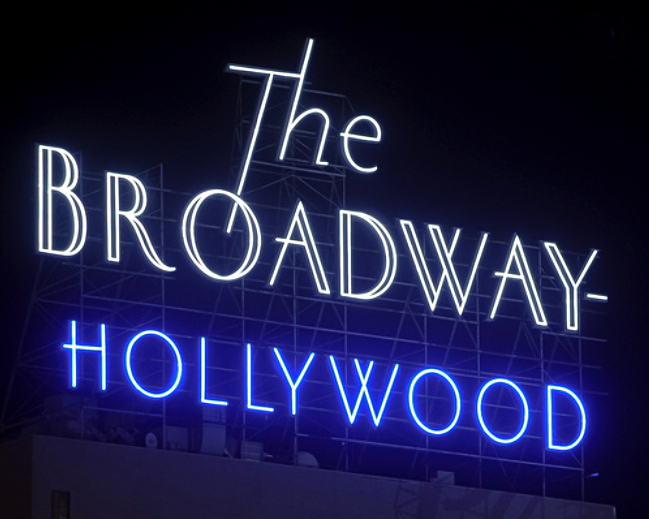 The giant neon sign to the Hollywood Broadway as it was getting restored in 2005. Originally built in 1927, the former department store, at Hollywood and Vine, has been converted to condos. Designer Eric Lynxwiler of MONA. 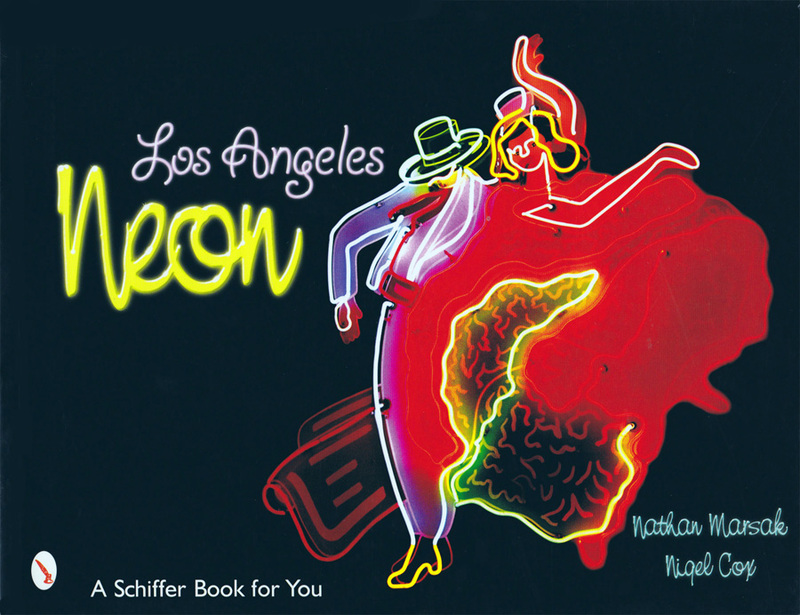 Cover of Los Angeles Neon by Nathan Marsak and Nigel Cox (Schiffer). Then in the mid-1960s another foe emerged—LBJ. Not Lyndon Baines Johnson, but his First Lady, Lady Bird Johnson, whose mid-1960s effort to beautify America by eliminating billboard blight also took aim at neon. "There were a lot of anti-neon sign laws across the country" in the 1960s and 1970s, Lynxwiler says. "That really ended neon as we know it." "In some cities it's [still] completely illegal," he says. "I don't understand the why of it." Ribbat's got an idea, though. "Those who feel alienated by neon light, or react to it with incomprehension or disgust, do so as a result of an overall hostility towards triviality and technology," he writes. "They do not care whether neon lights send out a multicolored glow. For them the tubes represent nothing but superficiality." That's not what the tubes represent to the increasing number of neon preservationists—or to their allies in the movement to revive troubled downtowns and commercial districts. Rudi Stern, who created light shows for the Doors rock group and New York City's Studio 54, and collaborated with artist Nam June Paik and performer Laurie Anderson, turned to neon in 1969, creating Let There Be Light, a neon workshop and gallery in New York's Soho neighborhood. "I have plans for neon pavements, neon highways, neon tunnels; neon on bridges, under water, outlining trees in parks," he told a reporter in 1981. Stern spearheaded a resurgence of interest in preserving neon and creating new neon that has continued to this day. But it's turned out—so far—to be more of a historic and artistic resurgence than a commercial one. "The craft of neon is on a downside, but the interest in saving neon is growing," Lynxwiler says. Meanwhile, Koga says, as neon continues to fall in popularity among sign makers—replaced this time not by fluorescents behind plastics but by increasingly affordable LED lights—more and more artists are using neon in more and more ambitious ways. And fans of neon have been successfully pushing to restore existing signs that for years had stopped glowing. Just as Los Angeles pioneered the birth of neon in the United States, it pioneered its rebirth. In the 1970s and '80s, Lynxwiler says, some mom-and-pop stores along Melrose Avenue began installing or reinstalling neon signs. 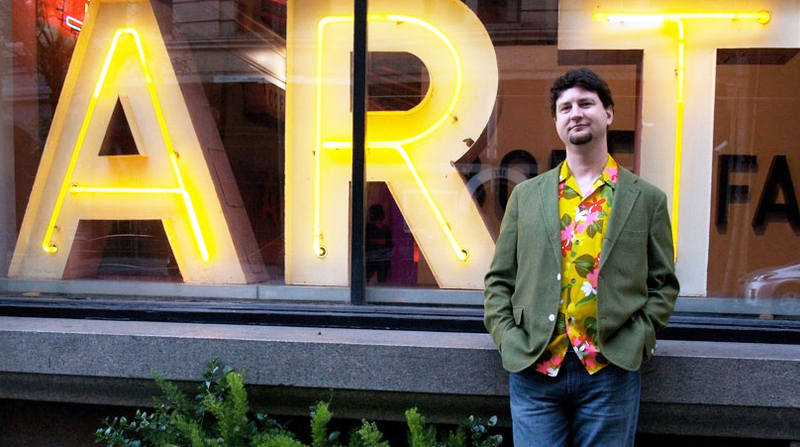 "They kind of revived the art and went back to the old craftsmen. They put neon on their buildings. They also put neon on our backs. It was these stores that were selling dayglo clothing." 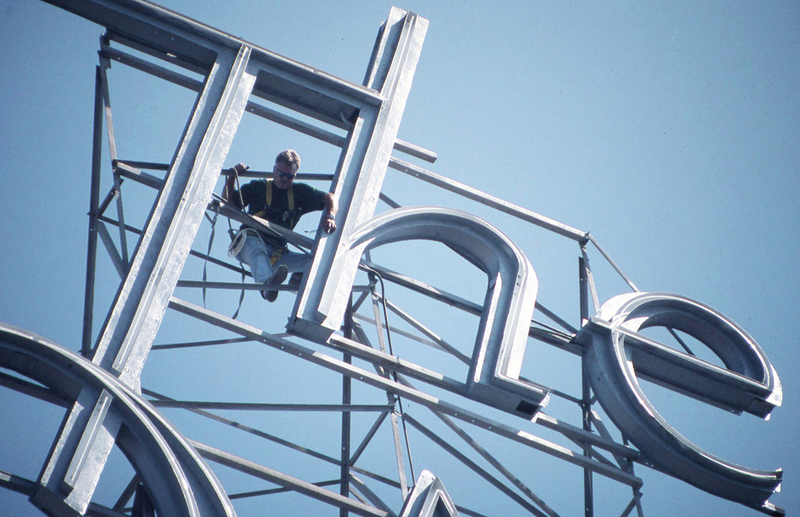 In the mid-1990s city officials commenced an effort, the Lumens Project—for 'Living Urban Museum of Electric and Neon Signs'—to relight signs in several parts of town including Wilshire Boulevard.